The Red Sox screwed up. 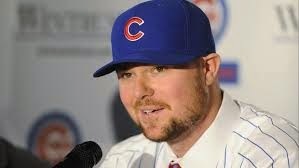 I was happy that the Red Sox did not win the bidding war with the Cubs when it came to Jon Lester. The contract just got way too crazy. I understand why the Cubs did it and I agree with the Sox for not matching their final offer. However, the Sox screwed this up last spring. Lester could have easily signed for about $110 million and that deal would have made perfect sense for the Sox. Instead they offered him $70 million. The Red Sox then made a $140 million offer this past week, which wasn't nearly as sweet as the Cubs deal. I don't blame Jon Lester at all. Good for him and good for Theo Epstein and the Cubs. Ben Cherington and Larry Lucchino both basically admitted the Sox screwed this up. This is not surprising from Ben but for Larry I was shocked. This is the same guy who shot his mouth off last spring about how the Red Sox philosophy is basically better than the Yankees because they don't give out long term, lavish contracts. Larry needs to shut up. I hate the Yankees too, but his words come back to bite him way too often. The Sox missed out on Jeff Samardzija because they were busy trying to sign Jon Lester who they didn't think was worth more than $70 million this past spring. Did I mention the Sox screwed up? Anyway, the Sox did get a three headed monster in the form of Wade Miley, Rick Porcello and Justin Masterson. Together, the three will make in salary what Jon Lester will make in a year. That is great value. These guys are all inning eating starting pitchers who get ground balls. The Sox desperately need this considering all they did have for the rotation was Clay Buchholz and Joe Kelley, both of whom are not what you would call inning eaters. Justin Masterson was hurt most of last season but his four previous seasons he averaged just under 199 innings pitched a season. Rick Porcello has been in the majors for six years and has averaged just under 179 innings pitched each season. He was 25 years old last season and threw 204 innings. Wade Miley has pitched three full big league seasons and is averaging just a tick under 200 innings pitched a season. Justin Masterson and Wade Miley both started on Opening Day for their respective teams last season. Are they really aces though and does it really matter? Ben Cherington was quoted as saying "Once Opening Day is gone the whole No. 1 starter thing is kind of overrated" He is right to a certain degree. Those of us who remember the Pedro Martinez led pitching staffs can remember how awful things were those other four days. A rotation without a true ace can get you into the postseason. It is all about depth and having lots of quality arms. However, who is going to be the guy who leads you to a World Championship once you get there? A dominant ace is really needed when you get to October. What are the Sox options? There is James Shields, even though he struggled this past October, he does have the #1 type of makeup in him. There is also Cole Hamels. Here is my issues with Hamels, in order to get him the Sox are going to have to give up at least two really good prospects and then the Sox will owe him around $110 million. That is the same price we could have had Lester back in the spring and would not need to give up prospects. Have I mentioned that the Sox screwed this up?